This outpost of the Texas Progressive Alliance hopes readers keep any New Year’s goals simple and measurable, and as goals not resolutions. This outpost also hopes readers consider or pursue life changes in the New Year that increase their contentment and are done at their own personal choice. SocraticGadfly describes how DSA darling Alexandria Ocasio-Cortez had another unforced error on Twitter — this one over Congressional pay in the shutdown. Gadfly also offered a roundup of his top blogging for the year, going by views and other factors. Much of it was devoted to batting down conspiracy theories. And here are some posts of interest from other Texas and national blogs and news sites. At the Dallas Observer, Jim Schutze takes a look at the white year, black year and general year in review, while giving good decade-aged kicks in the nads to John Wiley Price and the Perot clan. Texas Monthly looks at Steven Mark Chaney’s acquittal after serving 25 years on a murder sentence due to junk science.. Since this is a year-end wrap, Texas Monthly also looks at its top Texas books of 2018. Along with your host, Michael Harris suggests reading actual print books, even as he, an author, struggles with that. Ken Paxton’s prosecutors are challenging a pay ruling against them by the CCA, and he is trying to undercut them again, notes the Texas Tribune. Grits for Breakfast posts his 2018 top 10 criminal justice reform stories. Fracking of gas as well as oil is great for the Texas economy, bad for climate change, the AP describes. Dos Centavos posts his personal 2018 top 10. David Bruce Collins takes a look at how many of the U.S. Democratic freshmen are actually New Democrats. The Texas Trib notes that state Sen. Charles Schwertner remains in the MeToo spotlight after an ambiguous investigation. The Texas Observer catches my own state Senatecritter liking him some white nationalists. Unfortunately, as it also notes, after being primaried by a sensible state Rep. and winning, Bob Hall coasted to victory. The Observer also offers up a collation of six stories about rural Texas. ProPublica reports Dallas schools aren’t helpful for minorities, in many ways. Jim Schutze seems to have a bromance for Angela Hunt running for Dallas mayor; he’ll accept Scott Griggs. Juanita says "good riddance" to Paul Ryan. Therese Odell suggests a New Year's resolution we should all adopt. Many unions are still slouching toward Gomorrah. World Socialist notes a Wisconsin Aerospace local that scrubbed a strike and won’t tell the public why. Below are a few of my top 10, by volume, blog posts of 2018, with a bit of summary and a final wrap at the end. They're all at least somewhat related to conspiracy thinking, which bloomed in profusion this year, as much as rapid-response tweeting on various issues from President Trump. This summer, I called out Marcy Wheeler, aka Emptywheel, along with other Kossack alumni Dead-End Kids, for her absolutist claims backed by less than absolutist evidence that Donald Trump conspired with Vladimir Putin to get Trump elected. Speaking of Seth Rich conspiracy theories, back in February, I called out idiot lawyer Jared Beck and his DNC fraud lawsuit filing, which sounds like it was written with a crayon. Starting in February, and compiling more evidence throughout the year, I called out Beto O'Rourke for being a Fauxgressive ConservaDem. 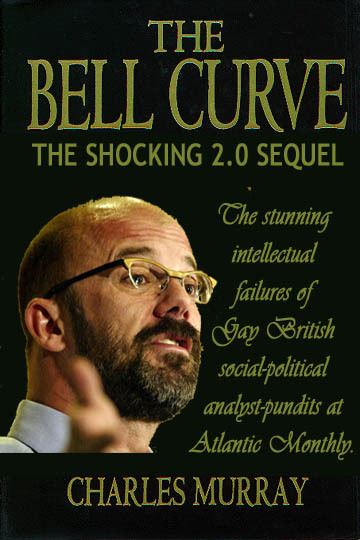 When Schmuck Talk Express John McCain died, I called out Beltway media stenographers, bipartisan foreign policy think tanks and the like for failing to tell the truth about a person who was an Islamophobe and a warmonger, among other things. 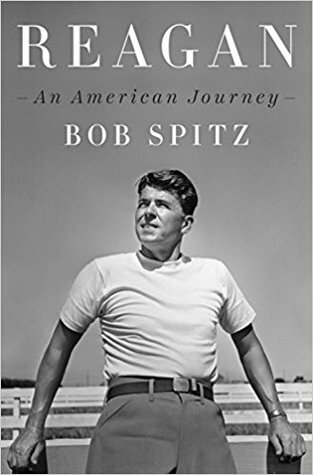 Fortified by that, later I called out the Beltway stenos and allies for similar hagiography when Iran-Contra and October Surprise co-conspirator Poppy Bush died. With that pattern, I invite you to read my 2015 post on practicing philosophical Neo-Cynicism, my update on Diogenes' original Cynicism, and rejecting the conventional wisdom — and not just in politics — of the chattering classes. Honda Insight 3.0: Will we be subject to more foolery? I remember the first Honda Insight, 15 years ago. I did, for about a year and a half, some of the automotive test drives, and writing, for the automotive section in my group of suburban Dallas newspapers. I test drove both the original Insight, and the original Prius, the one that looked kind of like a Yaris, not like THE PRIUS of today. That first-gen Prius had little acceleration, of course. But it did hit its EPA mileage estimates. Anyway, Honda had an EPA estimate of 70/61. Not even close in reality. And, I had a stick for my own car, so I knew how to do pretty butter-smooth shifting. I couldn't even hit 60 in city traffic, let alone 70. I didn't drive it on freeways outside the Metromess; I'm sure that, if I had gotten over 55 for any period of time, the highway mileage would have been 41, not 61. Wikipedia lists 40 under new EPA testing, so I was right! It was cars like this that led the EPA to get mileage testing out of wind tunnels and into real-world situations. Honda then pulled the Insight, even as Toyota prepared the new Prius, and it to be a separate nameplate. Seeing its success, Honda decided to fire back. The Insight 2.0 was, essentially, a Prius knockoff chassis put on a dumbed-down version of a Civic hybrid drivetrain. By dumbed-down, I mean, Honda stuck a three-valve per cylinder gas engine under the hood. It also had cheap fit and fixtures inside. Honda, I presume, had been looking at this at about 2008, not only seeing the success of the Prius but seeing oil prices go over $100 a barrel. 2010, just in time for the Great Recession to crush gas prices. It limped along for two years, then more and more people began realizing Honda was ripping them off again with a poor-acceleration car, even for a hybrid, and one that had no better gas mileage, even with the aerodynamics, than a Civic insight. So, Honda let the car run a usual four-year development cycle, with no investment after year two, then pulled the plug a second time. And now, per the new Consumer Reports? Insight 3.0 is out, I've read. And that magazine doesn't like it a lot more than version 2. Edmonds says the same main thing as Consumer Reports: The gas engine is very noisy under any serious acceleration. (It has a 1.5 liter gas engine vs. 1.8 on the Prius.) Otherwise, weirdly, it rates the Insight higher than the Prius. The best current version is 55/49 on MPG, says Wikipedia. Cars.com has the best version of the Prius at 58/53, even with the bigger engine. It looks better than the newest iterations of the Prius, which have been dipped in Toyota's recent bad styling for car front ends. But, that's about it. Interesting, both Edmonds and Cars.com like its interior, especially its screen display, more than Consumer Reports. Given Toyata's edge in performance, plus Honda's track record from the past, and issues with the current version (a tiny electric motor and batteries seem to be part of the problem), and it being the same price, roughly, forget it. I'd buy one of Hyundai's Ioniq's before it, too. They, too, perform better, but they have a Toyota-ugly front end. That, along with the trade for Paul Goldschmidt. which I highly salute, make them serious contenders for next year — and beyond, if they get Goldy to ink a new contract. But, Mo shouldn't stop there. They could stand further pitching upgrades, both starters and in the pen. Why? Because, especially with starters, there is no such thing as too much pitching. The second trade, that I've seen suggested elsewhere? A salary dump swap. Dexter Fowler goes back to the Rockies for Wade Davis. Salaries are just about dead even. Both might benefit from change of scenery, and the Cards are still in the look for a good set-up guy. Even allowing for the reality of Fowler's depression last season, as Bernie Miklasz notes, the bottom line is still performance. Rockies have a whole to fill with both Gerardo Parra and Carlos Gonzales not resigned, even if they try moving Ian Desmond out there after the Daniel Murphy signing, if he moves to first. David Dahl has looked decent for them in cups of coffee in 2016 and a partial season in 2018, but they might still want another outfielder. That would give a righty-lefty mix of relievers who have past, if not current, top-notch closer skills. It would also let the Cards consider stealing a page from the Rays against teams with lefty-heavy batting orders, since Miller has done multi-inning pitching in the past, and use him as an "opener," knowing Davis is still there. And, I'm willing to make that swap, even if Jose Martinez is also unloaded as art of another trade and there's little depth left in the outfield. Potentially, that gives the Cards a rock-solid set of moundsmen for both the rotation and the bullpen for the next three years. The Texas Progressive Alliance wishes everyone the happiest of holidays, and reminds you Laplace is the reason for the season as it brings you this week's roundup. Off the Kuff took note of the latest bit of fascination with small counties' vote totals. And here are some posts of interest from other state and national blogs and news sites. At Popular Resistance, Howie Hawkins explains why the Green Party needs to go (back, in some ways) to a dues-paying membership. I agree — it undercuts the power of paper parties that have too much; it addresses the "cheating candidate" issue that the GP faces at the state level, usually in these paper parties; and it has a left-wing political history. Better Texas Blog calls the commission's report a "good start". 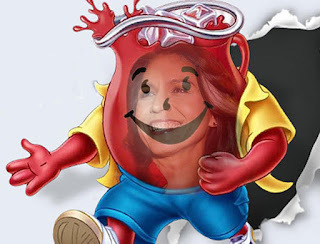 Alexandria-Ocasio Cortez, red rose Congressional queen of the House of Lancaster, I mean, the Democratic Socialists of America, has had several unforced errors since beating Joe Crowley to essentially win election to her 14th Congressional District. First and most notable for people like me who bat outside the duopoly on foreign as well as domestic policy, was her retreat from words of support for BDS. Second and related was her gushing over the Schmuck Talk Express™, John McCain, when he died. Well, now, she's shown that she should tweet less, research more, including knowing some basic constitutional facts, on the government shutdown. AOC has a set of tweets that The Hill "reported" into a story, and oh, there's so much wrong. First, she says Congresscritters should have salary cut off, after decrying partisan nature of shutdown (yet being already bipartisan enough to not call out Freedom Fries Caucus head Jim Jordan by name). Second, she ignores a problem (which The Hill itself gets wrong as to the "why"). You can't cut Congressional salaries. That relates to her not even mentioning the president's salary during the shutdown. Which, yes, also falls under the same rubric as that of Congresscritters, which The Hill got wrong. As for Congress, per the same link, in the current Congress, it's illegal to cut their pay, explicitly, by the 27th Amendment, which The Hill also gets wrong. When the new Congress starts, AOC could push a bill on the first day of the session that they don't get paid until the shutdown ends. She could also ask for it to be part of the standing rules in House and Senate. If I am engaging in correct constitutional interpretation, that could pass muster. But, short of an amendment, she still can't do anything about the president's salary. Finally, if we're going to criticize Beltway stenos for "reporting" on Trump's tweets, should we not hold the stenos to the same standard re Ocasio-Cortez? I say yes. That piece had no actual reporting and was inaccurate. I've already Tweeted to the particular Beltway steno who "reported" this, specifically on the error, and got no response. Update, Feb. 20, 2018: She's had other unforced errors, like throwing Rep. Omar halfway under the bus on Israel-Palestine issues. Picture Ronald Reagan first giving his famous "A Time for a Decision" speech not in October 1964 as a Barry Goldwater fundraiser but a year earlier, for whatever reason, but it getting just as much attention then as in reality. Many of the SoCal conservatives who backed Goldwater might never have jumped on that train. They would have seen Reagan right then as both more packageable and more charismatic than Goldy. As to people saying he was a political novice? One answer would be the rhetorical "So was Ike." Another would point at his Screen Actors Guild presidency and related items. How would Reagan have fared? In my opinion, he would have bombed even worse than Goldwater. First, he would have made some of the same gaffes as Goldwater. Remember, he worried that GE would fire him, years before GE Theater's ratings slid and they mutually separated, over his attacks on the TVA — attacks just like Goldwater made. Remember, already by this time, Reagan had mentioned voluntary Social Security. And, parallelling Goldy's "Let's lob one in the men's room of the Kremlin," just move back 20 years Reagan's open mic mic-check of "The bombing begins in 5 minutes." And, Reagan, just like Goldy, opposed the 1964 Civil Rights Act. With no presidential debates, Reagan's 1980 "There you go again" to Carter would not have been heard. And, had he tried something like that, LBJ would have clobbered him over that. Assuming he did something like his mic check or even close, LBJ would have run the Daisy commercial. He also would have run some sort of "affable doofus" commercial. At some point he would have gotten under Reagan's skin, and a public blow-up by St. Ronald would have finished things off. He would have lost at least as bad as Goldwater. What if he then tried to repair things by a 1966 gubernatorial run? Pat Brown — who should have taken him more seriously in the real world — would have been encouraged by LBJ to go for the kill in hopes of kayoing the entire California GOP. So, Reagan loses again. That means, in 1968, he's not in competition with Nixon for the GOP nomination. He's a frustrated has-been. And American history changes a lot. He fails more than in reality in trying to get the 1976 Republican nomination. He's not even in the picture for 1980. And U.S. conservativism is forced to adapt, as Republicans and Democrats drift closer into neoliberal nuancings. Let's assume the final contract numbers in the Bryce Harper free agency derby are 10/$350. I am hoping the Cardinals, John Mozeliak and Mike Girsch do the latter. Especially with the recent trade for Paul Goldschmidt, of which I approve, meaning the Birds have less of a need for Bryce and can focus on their pitching. You've still got that one-half WAR per year difference. Besides Stanton, the Cards have shown that they're not always cheapskates. They offered Jason Heyward the highest AAV of any bidder, but lost in part (thanks for bailing us out, Cubs) due to no opt-out. They pursued David Price hard. They offered Phat Albert Pujols 8/$198 (thanks Arte for bailing us out). Just a friendly reminder on that: The Cards could still have him on the books for one more year had the Angels not stepped in. So, Mo will pay. And overpay. IF he decides to pay. What I am getting at is that Mo could be dumb enough to overpay for Bryce Harper, and that kind of worries me. I probably will have no need to worry. I think the team pivots to pitching with the Goldschmidt signing. I just wanted to add that, given Mo's track record, my reasons for worry are legit. Otherwise, if the Cards are looking for a relatively low-cost lefty OF to give more left-right lineup balance, Michael Brantley and Nick Markakis are both still out there. I think Markakis had an Indian summer year last year, so I would be leery of a lower-level overpay. Brantley is younger, and assuming 2018 showed he is past injuries, I'd give him a straight 3/$50 with some incentive money and a fourth-year option. The injuries is a judgment call. I would give Markakis no more than, say, 2/$30 plus an option year. If that. Texas Monthly introduces its 31 power brokers. Stephen Young notes that, despite Betomania, Texas voting turnout, at least in midterms, STILL sux. Texas Observer runs the syndicated Jim Hightower column that his syndicator, Creators, wouldn’t. David Bruce Collins takes aim at Alexandria Ocasio-Cortez and Bernie Sanders. 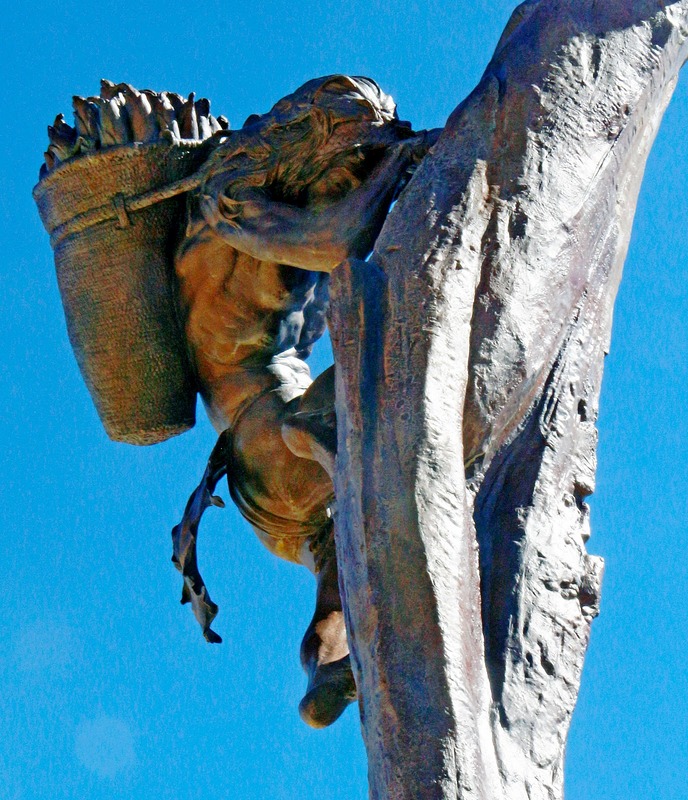 Mesa Verde — one last trip? 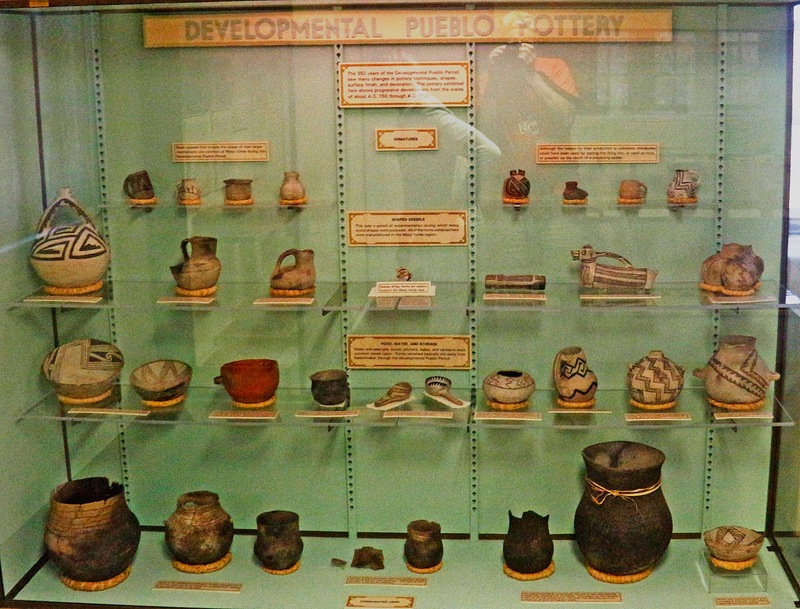 Mesa Verde of today illustrates well several of the issues that face today's National Park Service as a whole, and individual parks, including some that Southwestern parks face in an era of advances in science and in worries about climate change effects. From the area of the fire tower on Mesa Verde, looking north-northwest. Nearly a decade ago, I almost swore that the visit I made then to Mesa Verde might be my last ever. That was about a year or two after the National Park Service and park staff required people wanting to see Cliff Palace and, I believe, Balcony House to queue up for guided tours. No more individual trail walking. I understood why. It was a mix of the site being loved to death with carelessness as part of that, along with theft and probably vandalism (name-graffiti) too. Didn't mean I had to like what this made the park, as well as the obscene criminality or the carelessness from casual visitors. I did the tours, or at least Cliff Palace, because it was the first time in many years, and only the second time as an adult, I'd visited. But I didn't like it. And I almost swore it off. And, I decided to spend part of a day there while doing some down time at my brother's in Farmington. I got there and saw a nice artistic statue outside a nice spiffy new visitor center. And found out that you now have to buy tickets for tours to those two ruins at that spiffy new visitor center. Nope. 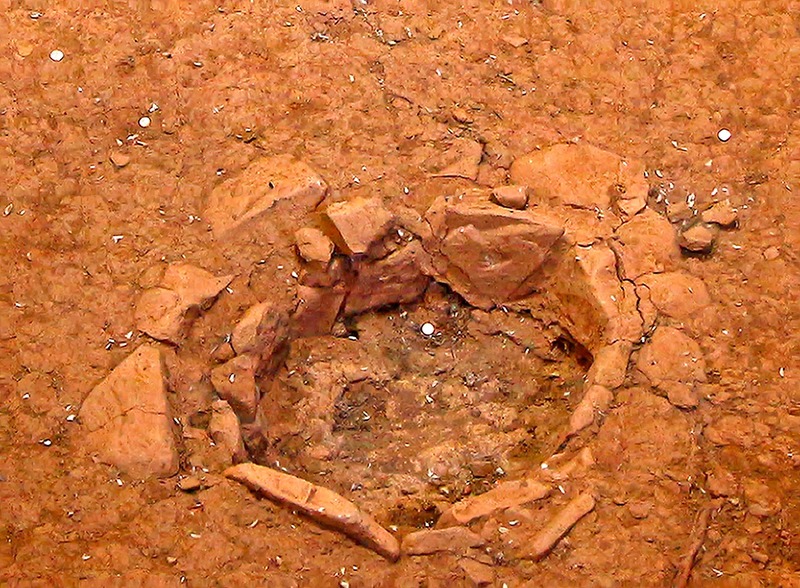 And, at a partially excavated site, the Megalithic House site, people had thrown money inside the kiva. That, too, is vandalism, folks. It's also "interesting" that Mesa Verde has gone to "frequency pricing." A year ago, the Park Service proposed peak-season fees at 17 other sites, but they're already in place at Mesa Verde. That said, on-season and off-season only differ by $5 at Mesa Verde, not $30 or more. Meanwhile, parts of Mesa Verde feel frozen in time. Not frozen in time of 700 years ago, but of 70-100 years ago. 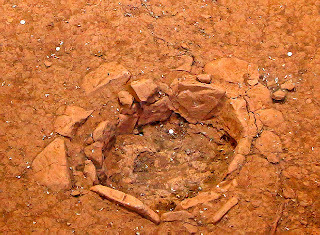 Anasazi artifacts, but is the information presented along with them up to date? 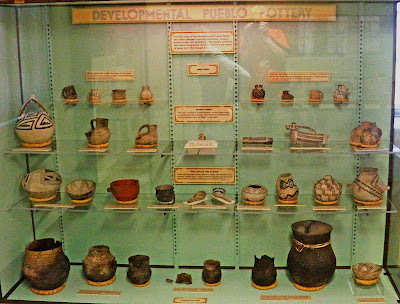 Most the dioramas at the Chapin Mesa Visitor Center were made in the Depression, by CCC laborers. I'm not looking for Mark Zuckerberg to offer Oculus Rift virtual reality. However, there's been a lot of Anasazi study in the past 70-80 years (setting aside whether any information on any of the dioramas was starting to go out of date even at the time they were created). Tastefully more modern displays with up-to-date information would be welcomed. With appropriate money, a park staffer to lead guided tours through the museum and updated exhibits once or twice a day would also be welcomed by many, I would think. That's if money for that becomes available from new and additional funding for the Park Service in general. Sorry, Democrats, including a few alleged progressives who actually aren't, but using part of BLM's oil and gas fee money to fund the Park Service is NOT the answer and I really don't know why you think, or ever thought, it is. See below for more on that. And, the dioramas would take a definite back seat to more urgent needs, even more urgent than reopening the trail to Spruce Tree House. Oh, like fixing a fire hydrant that would be the only salvation for those visitor center dioramas should a fire sweep through the heart of the park. Given this summer's wildfire season, which was bad enough in the Four Corners before California knocked it off the front page, this is simply inexcusable. Per the cutline, this is right next door to the Chapin Mesa Visitors Center and buildings complex. We know that climate change is only going to make the Southwest hotter and drier. Fire hydrants like this need to be fixed immediately. Not tomorrow or six months later, but immediately. I don't know if that's the only one broken. Probably not. And, I don't know why it's out of order. Old water lines would be one guess, though. 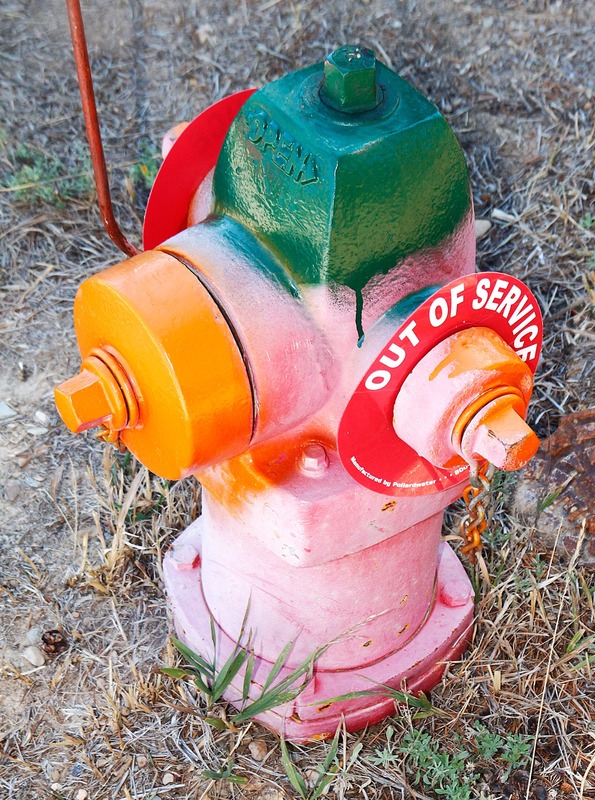 In other words, the out-of-service hydrant is a symbol and stand-in for larger infrastructure problems at the park, and the park, in a mountain-desert transition area, is at a juncture of climate change environments. And, that is not all that needs to be fixed, either. 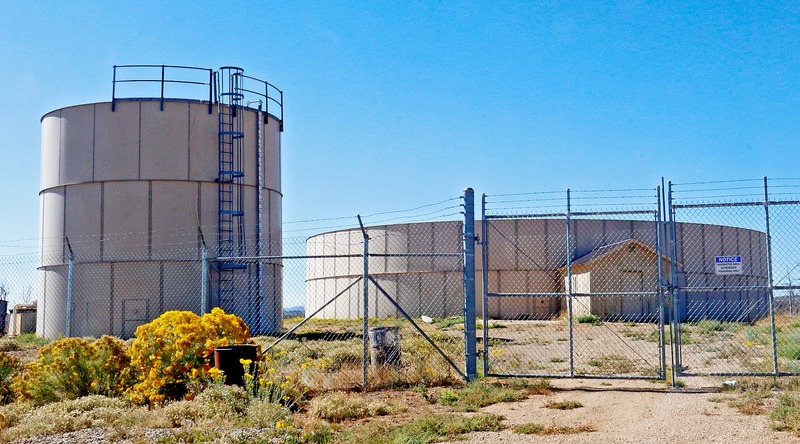 NPS facility or private inholding remnant? Either way, it's ugly and unsafe. Although Mesa Verde does not have the degree of problems of some national parks, it does have, or had, two private inholdings. (I don't know how recent the link is, but it appears to date to the 1970s. From what I can tell, the Sheek inholding was bought in the 1980s, but I still don't see that having happened on the Hindmarsh.) And the federal Land and Water Conservation Fund remains at the mercy of Congressional wingnuts. 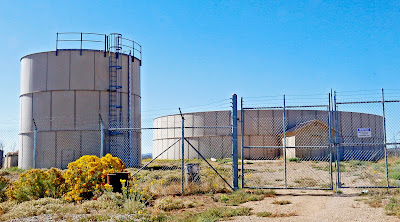 I don't know if the facility pictured at right is part of a private inholding or not; it looks like an oil tank battery, but could be something for wastewater from the nearby Far View Lodge. I don't recall that sign on the fence explicitly saying it's private property. That said, let's say it is for the hotel, and it's government-owned. It's a fricking eyesore. The standard chain-link fencing doesn't help. Find the money and the labor — maybe through one of the student conservation programs — to build something like an inexpensive adobe wall. Said wall would also have containment value should either one of those tanks burst, as well. Water, sewage or whatever is in them, as it stands, that's a safety issue as well as an eyesore. And, no, Raul Grijalva, taking a Ryan Zinke idea and turd-polishing it, of using BLM oil and gas funds to help pay for additional Park Service money, is not the answer. Ethically at least, especially on the issue of Southwestern parks facing climate change, your "answer" is part of the problem, not part of the solution. Personally, I would go back to the old Parks Pass at, say, $75 a year. Bump the All Access Pass to $100 — and make clear it covers ALL normal USFS fee areas. (Along with that, revising the 1872 mining act and other things would be part of the ideal plan.) I would be OK with some "peak pricing," as long as not too steep from off-peak times. As for the paid tours, or the tours in general, and vandalism likely still happening there, as well as sites like Megalithic House? There's always the Ed Abbey answer — put it all under the equivalent of shrink wrap and close access entirely. The St. Louis Cardinals have gotten slugging first baseman Paul Goldschmidt from the Arizona Diamondbacks in exchange for Luke Weaver, Carson Kelly, prospect Andy Young and a comp balance draft pick in the second round. Even for "just" a one-year rental, it's not bad. If the Cards can resign him, it's great. If not, they'll get back at least the lost draft pick and then some with a first-round choice. And, I approve the deal even more, as of mid-March, with the Cards doing just that, with a five-year, $130 million deal that was a bit cheaper than I thought. The rise of Andrew Knizner was deemed quick enough that Mo must have considered Kelly expendible as a backup catcher and still not likely to be No. 1 as long as Yadier Molina was around. Luke Weaver probably doesn't have too much higher of a ceiling than he's already shown in St. Louis. Andy Young has some positional versatility, but hadn't made it to Memphis yet at age 24. He likely would have been the next Greg Garcia or Yairo Munoz, and the Cards already have both of those. Beyond that, I expect Wong to make a jump forward with a full year free of the double-guessing of Matheny as manager. This would seem to rule out Manny Machado, if he was on the Cards' radar in the first place. It does NOT rule out Bryce Harper, or a free agent pitcher, or a trade for a starter. As for the possibility of resigning Goldy? His current $14.5M plus the $13M of Gyorko add up to $27.5M. That's enough money to resign Goldy without a payroll increase. Six years at that AAV, front-loaded a modest amount? That's what's behind this picture at the George H.W. 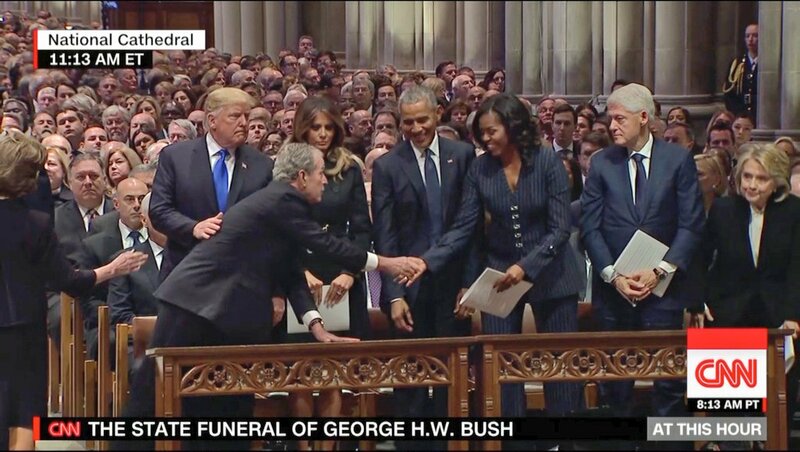 Bush funeral. And, the mainstream media, insisting it is part of this ruling class as the Fourth Estate, insists we mourn. Because without such mourning, especially when based on the mythos of American exceptionalism, both that mythos and the American empire associated with it are hard to maintain. So, with both George H.W. Bush and John McCain, the Fifth Estate insists we mourn — for the mythos of these individuals to prop up the mythos of American exceptionalism and American imperium. Of course, there are exceptions. The media exceptions are usually from the left, with the exception of a few paleoconservative and libertarian sites that will object to the foreign policy of the likes of Poppy Bush and the Schmuck Talk Express. What needs to be mourned, instead, is the tenacity of this mythos, and the tenacity of the subservience to it of the 99 percent of American media. You — yes, you — are Individual One in the hearts of the Texas Progressive Alliance and this week's roundup. Off the Kuff did a deep dive into straight ticket voting. SocraticGadfly first takes a critical look at the public service of George H.W. Bush; he then describes his visit to Tsarskoe Selo, where an ex-spook told him a conspiracy theory about why Saddam Hussein invaded Kuwait, eventually triggering Bush's Gulf War. And here are some posts of interest from other sites. Speaking at Rice, Barack Obama congratulated himself for helping exacerbate climate change while James Baker congratulated himself for not needing a Poppy Bush Iran-Contra pardon. At the Texas Observer, Gus Bova says climate change is a major factor driving the Central American immigrant caravan to Texas and other border spots. Raise Your Hand Texas lists the five things needed in any school finance plan. Robert Rivard laments San Antonio's 20th century mindset for urban planning and design. David Bruce Collins talks about two-siderism being behind CNN’s firing Mark Lamont Hill. Therese Odell is all over the 60 Minutes report on the damage caused by family separations. Julien Gomez implores allies of the trans and nonbinary community to speak out. Jim Schutze observes that the anniversary of JFK's assassination is more of a reminiscence these days. Sarah Martinez has important Buc-ee's restroom news. Black Agenda Report notes that Jill Stein's recount has forced Pennsylvania to agree to paper trails and audits on future ballots. Rumya S. Putcha says yoga centers are the new country clubs — with all the baggage of Eisenhower-era country clubs. Jeff Miller discusses what all is involved with small school districts downsizing to six-man football. Creators wouldn't pass out Hightower's latest column, because he criticized Dead Fricking Media and Slavehouse Media.